Villa Albergati is a huge house close to Bologna built in 1659 by architects Bonifacio Socchi and Gian Giacomo Monti. There was a plan for its transformation as an imperial residence for Napoleone Bonaparte, dated back to 1805. In particular he wanted to plan a new park, full of small buildings in the style of landscape gardens. We are lucky enough to be able to see today all the drawings made in preparation for this transformation that, unfortunately, never took place. The project was commissioned by the painter Antonio Basoli and the architect Ercole Gasparini. There are some drawings that show, similar to what would be found in a catalogue, the list of fabriques that had to be scattered across the park. 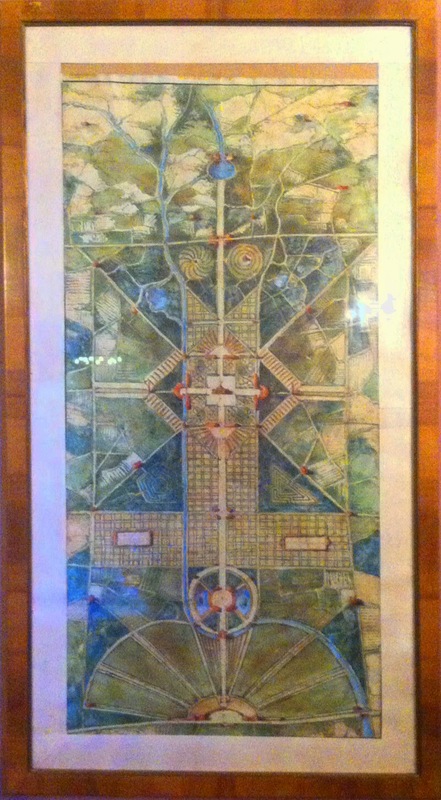 These drawings are now preserved in the Centro Studi Ville Bolognesi in the city of Zola Predosa, while the plans of the whole garden are exhibited inside the Villa which is now used as a conference center and restaurant. A few words about the authors, because it will help us to understand why they designed the garden the way they did. Antonio Basoli was a painter and a stage designer. His major works are: Raccolta di Prospettive Serie, Rustiche, e di Paesaggio (1810) and Vedute pittoresche della città di Bologna (1839). His favorite subject was Roman architecture, and it is what his project for the fabriques would eventually look like. Ercole Gasparini was a famous architect and a teacher at The Academy. Greek and Roman art served as his models evidenced by the huge collection of 277 drawings preserved in the Gabinetto di Disegni e Stampe dell'Archiginnasio in Bologna. 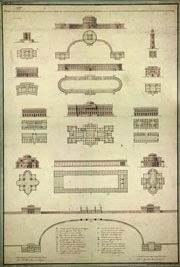 He designs five funeral monuments in Bologna's Certosa. Returning to the main argument of this post, let's have a look at the big plan of the park, in the first picture. We can easily recognize the key elements of the project: the house is exactly in the middle of the drawing. The garden is divided into two main parts. 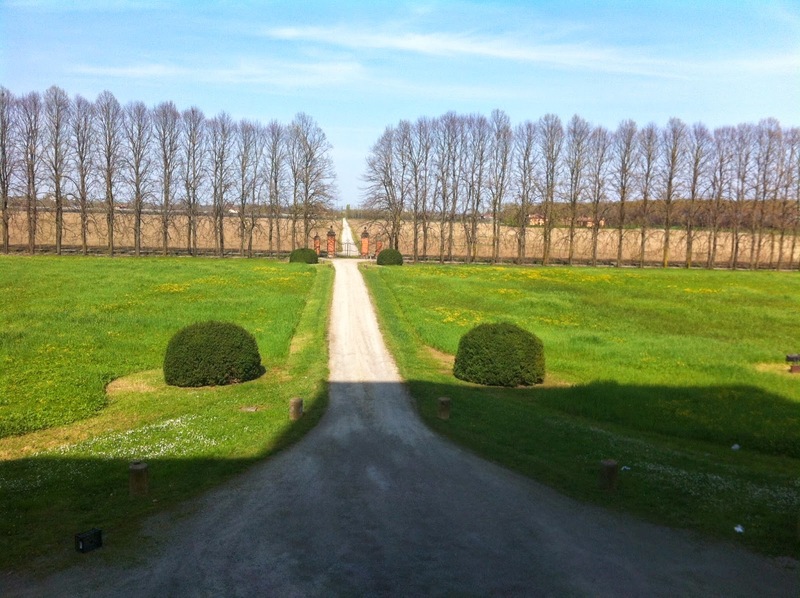 In front of the house (in the lower part of the drawing) we see the formal garden. The idea of this survives today as you can see in the last picture. Behind the house (in the upper part of the drawing) there is the landscape garden, with all its typical elements: rivers, lakes, hills, and small buildings all around. To be more precise, I have to notice that the closest part to the house, even in the "landscape" side, is designed as a formal garden. This follows the style of William Kent who established that the open area around the house must continue the geometry of the interior. I didn't find bibliographical resources yet, but here is a list of websites you can look at to read something else about this exquisite place. Alexander Pope, Epistle IV To Richard Boyle, Earl of Burlington, 1731. Anther winter distraction — forcing spring bulbs.